I sit at a crossroads of sorts. Let me just review what I have in front of me, the pressures lurking over my shoulder and nudging me to get on with it already. Moving – due to a previous group decision with my current roommates it’s time we all moved on and need to find another roof – by end of JULY. Company – Seconds, the company I started last fall with some friends is starting to take off but requiring more from me every day. This is both uber exciting and uber challenging. Community – Recent events have elevated me and my company in the startup community. Along with the attention comes pressure to succeed. I both fully embrace it and yet fear it (for obvious reasons). Bills – Bills, bills and more bills. They are starting to pile up and bother me. Is this what we were put on earth to do? Pay f-ing bills?? Girlfriend – not even a chance right now. Family – again, where does the time go…? Entrepreneur = No Idea Where You Will Be Or What You’ll be Doing In A Month. I am not joking. I have no idea where I will be living in just 30 short days. And I have no idea what I will be working on… I hope it’s Seconds, we have some pretty sweet things coming down the pipe and I can’t wait to roll em out. But, there are no guarantees and a brotha’s gotta feed himself. Until someone (or a few) step up, look me in the eye and tell me they believe both in my vision and that I am the leader who can make it happen, the odds are REALLY not in our favor. I suppose once things do take hold – once I cross the chasm and actually make it – life will get a little easier. Although I imagine my petty issues will get replaced with other, more important ones like dating, marriage, kids, house, school, corporate, etc.. 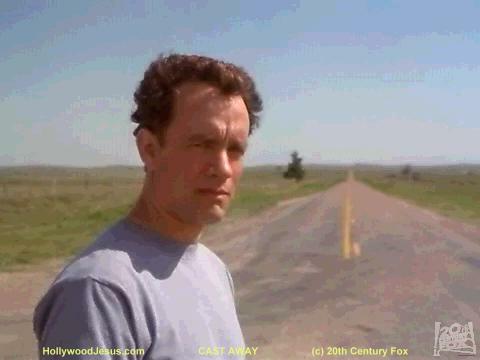 The image in this post is from the last scene of one of my favorite movies, Castaway. In it, Tom Hanks plays a character named Chuck who’s plane crashes in the ocean and he is the lone survivor, left on a deserted island to fend for himself. Amazingly, he continues on living for about 4 years until he musters up enough energy to actually build a raft and set sail for whatever the sea has in store for him. Strange as it is, you sense as the movie progresses he feels he has nothing left to live for. He decides launching the boat and seeing what happens is better than life alone on the island. Ultimately he is found and brought back to reality – a reality where everyone else from hist past has moved on with their life, including his fiancé Kelly. So back to the image from the end of the movie. There he stands, at a crossroads in his life with no real pull any which way. Actually, that is not exactly the whole story. The plane he was on at the time of the crash was a FedEx cargo jet carrying many different packages from one continent to another. After the crash and as he initially washed up to shore, he saw some packages on the beach. When he picked this one up he noticed some Angels wings nicely drawn on it. 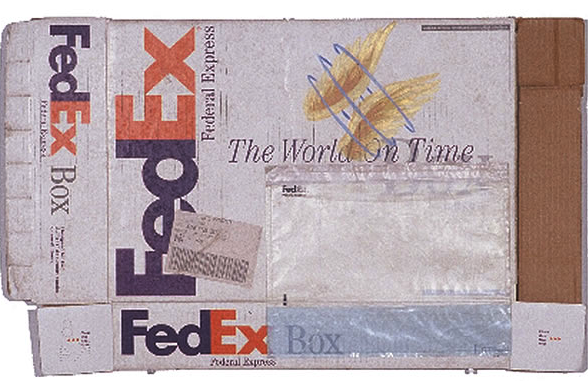 Believing there was more to this package, he kept is a guiding icon for his survival and also committed to return it to the sender once he got back. 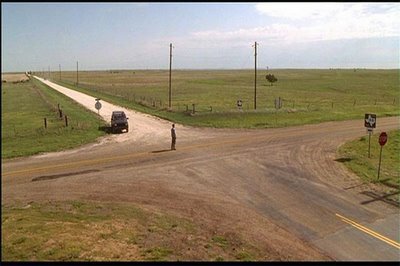 That is why he was standing at the intersection of those 4 roads that day. He had dropped off the package and then pulled over to decide what direction he should go next when up pulled a truck with a beautiful woman asking if he was ok. As she drove off he noticed (once again) the wings drawn on the back of her truck. The camera pans his face… and then the movie ends. One can only speculate where he decided to go next, but pretty good bet he was pulled the direction of the woman and the angel. And that is where I find myself currently. I stare at quite a daunting crossroads but feel deep down my intuition is pointing me the right direction. My gut tells me I haven’t been wrong these last years as I have been diligently working towards the opportunities just now opening up and taking shape. Sometimes you just have to withstand unbelievable challenges to get to unbelievable outcomes. As the movie ends and you see Chuck’s face, you get the feeling he knows he wasn’t wrong believing his survival of over 4 years alone on that island wasn’t all for naught. As a fellow entrepreneur, I seem to encounter a similar type of crossroads every 3-6 months. I recognize that this lifestyle I chose dictates this sort of regular change and surprisingly I’m getting more used to it and can better prepare myself to deal with it! It takes some getting used to for sure! Sounds like you are dealing with it quite well?? Awesome, awesome post, Nick! I’m still in the stage of never actually starting anything yet (while finishing up school), and you’re post is really inspiring. Seeing others (who are at least a step ahead) face the trials of reality is scary yet exciting. I like to say I’m living paycheck to paycheck, but without the paycheck. Thanks for writing! Awesome Yehuda! Keep rockin’ and you’ll be there before you know it. Trying to keep the work-life balance as an entrepreneur is almost impossible. My solution was to shed all those who didn’t matter in life to just a few who i can’t do without. Even with the small successes I’ve had, I’m yet to reach that phase where “life gets better”. I dissolved companies of mine over co-founder rows (hard lesson) and a few months ago I started on a new and bigger journey solo(no co-founders) while i put my life back together (split-ups compensations are costly). Nick forgot to mention he’s having a ball all the while, it’s that scary feeling of adventure that treps are addicted to. Thanks for this one Nick, you always seem to have the right words at the right time for fellow entrepreneurs to keep putting one leg in front of the other.